The hilly nation of San Marino may not be the first country you think of when you contemplate the rev of engines and bikes whizzing on a dark asphalt track. And it’s a fact that the San Marino GP is actually held in the Italian town of Misano Adriatico in the province of Rimini at the Misano World Circuit. 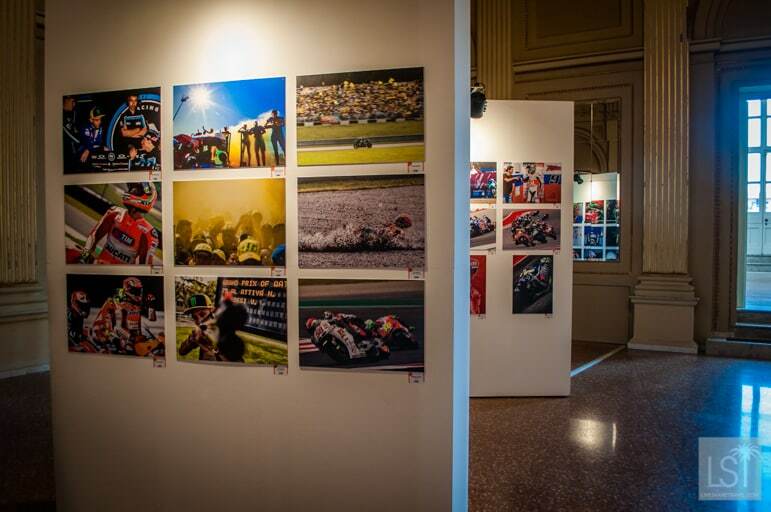 And that’s not the only connections that San Marino GP and Rimini have – they are also linked by the enviable creative talents of one man. Aldo Drudi is an Italian icon. 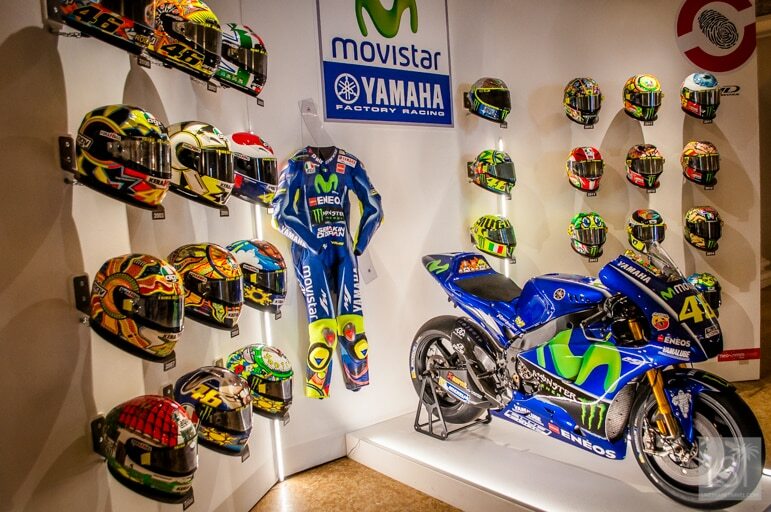 Creative, visionary and a mentor to the stars of the motorcycle racing world, he has designed motorbikes and helmets for names like Valentino Rossi, and even turned has his hand to the track for the San Marino GP. His reputation and standing with regard to crash helmet safety and protective clothing mark him out as a great innovator. 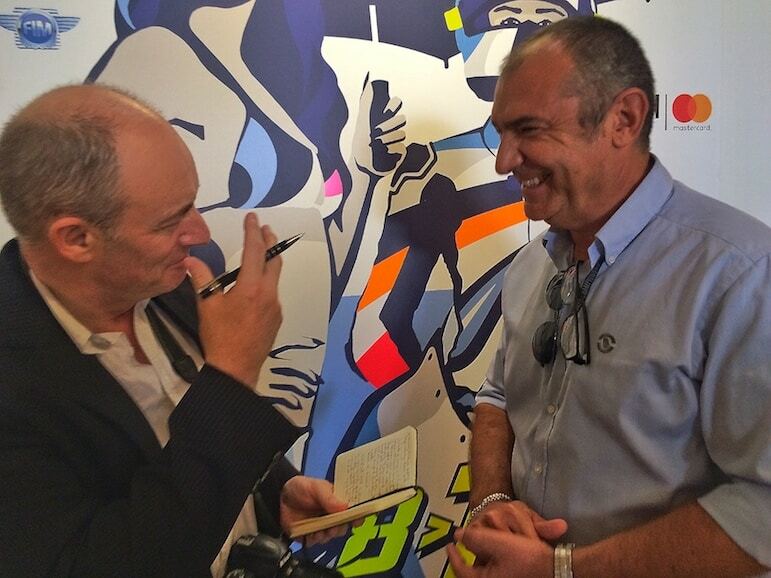 I met him at Rimini Motor Soul exhibition celebrating The Riders’ Land – just one of the phrases that highlight San Marino GP and Rimini’s importance on the world motorbiking stage. There at the Italian coastal town’s Galli Theatre, Aldo proudly recalled how he started designing crash helmets and protective clothing in the 1980s, simply because: “no one else was doing it”. 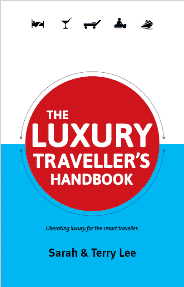 In Emilia Romagna – the region in which Rimini sits, motorcycles are as much a part of the society as the fabulous food for which it is celebrated. Explaining the history of motorcycles in the Emilia Romagna region, Aldo’s history was as perceptive as his innovation. He told how motorcycles took off after the Second World War when 80% of Rimini was destroyed. As the town struggled to reestablish itself post-war people were poor. “With so little money around, local people had to make and repair everything themselves,” he said. This hardship impacted the culture and influenced the local’s mindset, their approach to society, and indeed their way of life. Motorbikes became something of a social phenomenon in Italy, but especially in Emilia Romagna, to the extent that many professional racers were born in the region. Rimini is also home to Italy’s National Motorbike Museum, telling the story of life on two wheels. It really is The Riders’ Land. History is important to Aldo too. Before starting his designs of the elaborate and colourful protective clothing and helmets, he conducts extensive research. 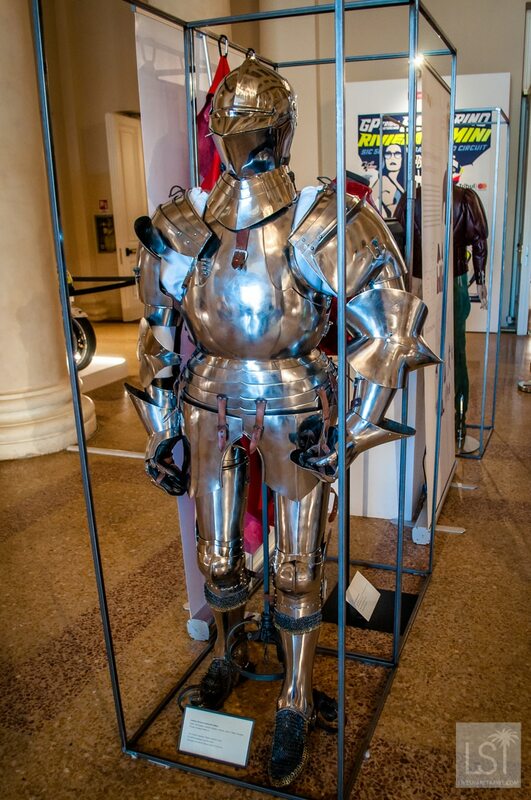 He told me how he compared modern protective motorcycle wear to that of historical knight’s armour, worn for protection in battle. 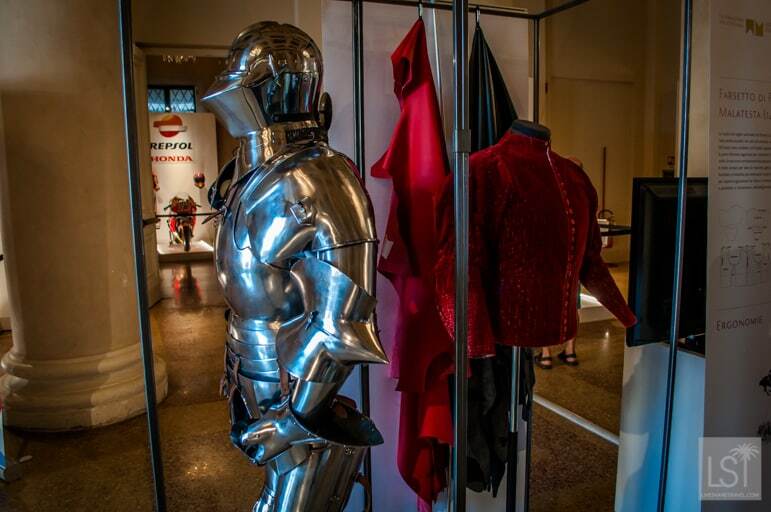 Aldo made a direct connection between the ancient designs of a bygone age and the contemporary needs of today and explained how the past informs the present highlighting how so many elements of protection required for the arms, knees and elbows were built in on centuries-old thinking. It’s this attention detail that has firmly established Aldo as a master craftsman. 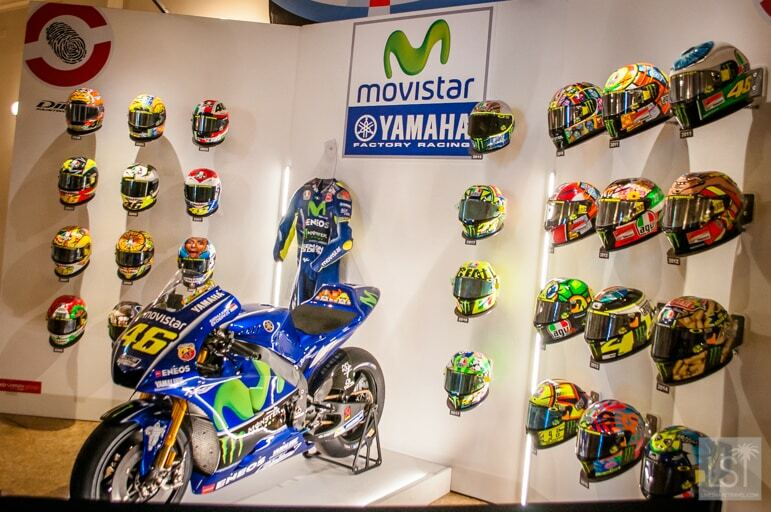 World champion rider and local legend Valentino Rossi is one of many big names that has benefitted from Aldo’s creativity and innovation. He told me that he is friends with Valentino’s father and has known Valentino since he was a child. 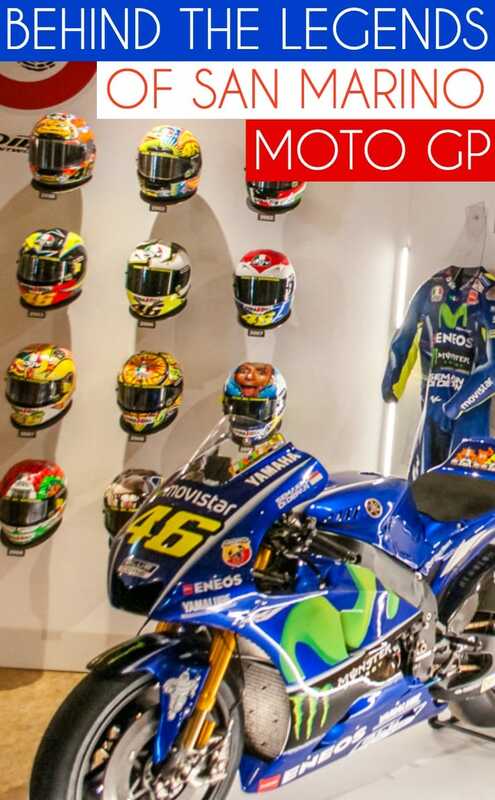 Today they work closely together and Aldo makes all of the helmets worn by the world’s greatest motorcyclist. 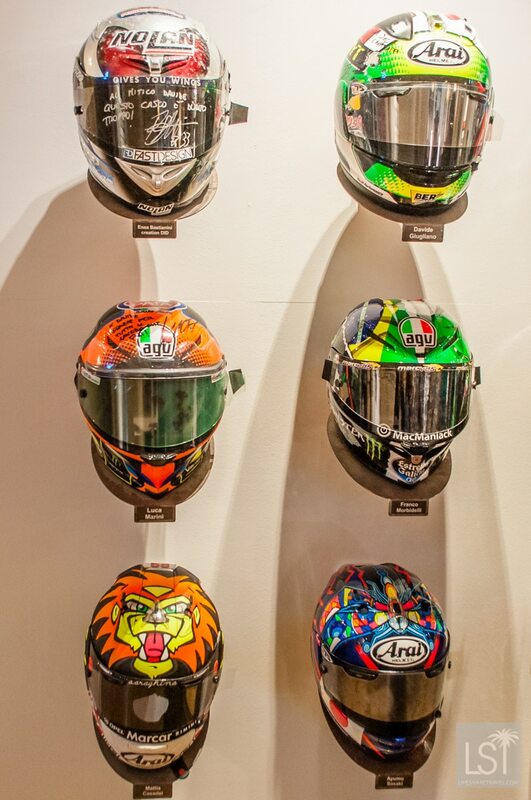 And that each of those helmets has a different story to it. Aldo is as immersed in the world of motorcycles as it is possible to be. “Riding a bike is a way to fight your fear. But riders are not crazy,” he stated, affirming that safety, and therefore crash helmets, are sacrosanct. 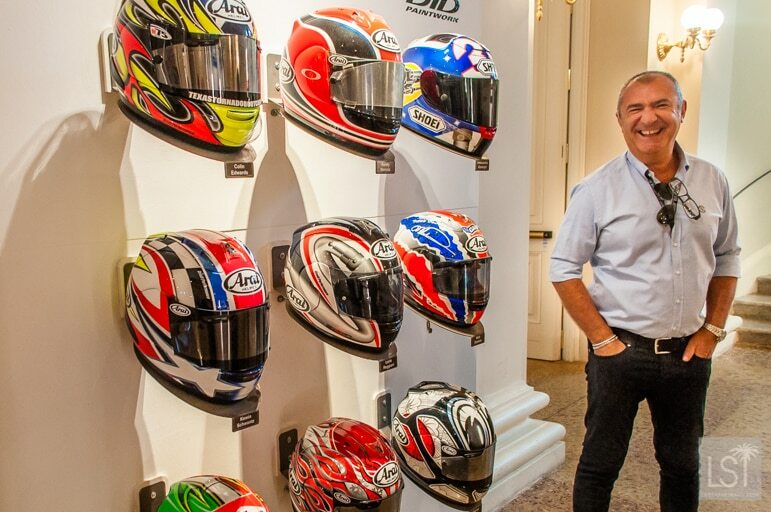 And as he continues to help formulate the future of motorcycling as a sport, he insists that electric bikes are the way forward and the petrol heads of today will have to adapt to quieter engines. It was a challenging thought, as I was in the region to attend the San Marino MotoGP, which was happening the next day. For this year’s race, Aldo had designed a whole new colour scheme for the gravel taps and run off areas. The following day after our meeting in Rimini, I met up with Aldo again at the MotoGP as we all eagerly awaited the race. Rain fell hard and the track making the riders brightly coloured clothing and helmets stand out against the sodden graphite track. It didn’t dampen the fervour of the throngs of people that packed the Misano World Circuit though. And the anticipation mounted as the main race approached. Out before us, to brighten the grey skies, was a colourful sight and a carnival atmosphere, as fans in team colours gathered amid a sea of umbrellas. I was fortunate to be in the VIP area so was undercover and also right above the start and finish line, so had an outstanding vantage point from which to watch the race. I really felt for those standing in the open and getting drenched as their reward for their love of the sport. These fans were also missing their hero as Valentino Rossi, the nine-time world champion had broken his leg the previous week so was out of the race. Unfortunately, due to copyright reasons, I am unable to share photographs and video that I shot of the race. I may have unsharable photographic evidence of the race, but what’s more important is what I remember of the occasion and of the atmosphere that permeated the whole day. Sporting events like the MotoGP have a long history of bring people together, generating excitement and producing memories that will long outlive the occasion. I’m proud to say, I will take that all that with me as my lasting memory of my visit to the San Marino MotoGP.